If I File Bankruptcy Will I Be Able To Borrow Money Again? Will I Be Able To Borrow Money After Bankruptcy? Many people face a bad financial situation where their only option may be to file bankruptcy. Once this is done, a person may wonder how soon they can borrow money once they have completed the bankruptcy. This will depend on several different factors. This includes a lender’s policies concerning individuals with a bankruptcy, the type of bankruptcy filed as well as a person’s discipline when in comes to improving their credit score. Many types of borrowing is determined by how recently a person has received their bankruptcy discharge. With a Chapter 7 bankruptcy, a discharge occurs relatively quickly. A Chapter 13 bankruptcy will take a longer period. It is possible for people to believe their bankruptcy discharge date determines when they can again borrow money. The real date is determined by lenders. It is the date lenders are prepared to loan money. There are many people who file bankruptcy that is a 7 or 13 and get a discharge. They often wonder how soon they will be able to purchase a new home. The first criteria are if the person is able to afford the monthly payment. The second is if the person has saved enough money to make the required down payment. The third one is finding a lender who is willing to provide a loan to someone with a prior bankruptcy. Most people wonder if they meet the first two criteria, how soon would they be able to get a home loan. Most lenders who provide such loans will wait approximately a year after a discharge date, and some lenders wait two years. There are lenders who refuse to lend money to a person who has ever filed bankruptcy. That is their internal policy. Many people with a bankruptcy are able to get a car loan approximately a year after they’ve filed a bankruptcy and received a discharge. When it comes to credit cards, it could happen almost immediately. Some people believe this is kind of backward. The best type of collateral for a person is a house and the worst is a credit card. Many lenders provide credit cards like they’re candy. It is very tempting for individuals to abuse a credit card. This is how a financial institution makes money. They want to loan money and charge interest. A person’s objective when borrowing money from any financial institution is not to borrow what they can’t afford to repay. They need to become economically minded. It is best a person not put a balance on a credit card if they can’t repay it the next month. People need to know how to avoid borrowing money they cannot repay. This is considered being proactive. Should a person get a credit card soon after they bankruptcy discharge, they must be responsible. It is time to be careful. Once a person has a discharge, they can learn to rehabilitate their financial record and carefully rebuild their credit score. It is recommended when people get a new credit card soon after their bankruptcy discharge to use it carefully. This will help to make a person appear to be a good credit risk. Once a person rebuilds their credit, their FICO score will increase. This will ultimately make it possible them to qualify for a loan from a well-established lender. They won’t have to settle for loans with high-interest rates. It’s also possible for them to eventually qualify for a home loan. This can happen when a person has saved enough money and can be considered a good credit risk. A bank is willing to give a home loan to a person who has worked hard to get a good income and have enough money for a down payment as well as the monthly payments. 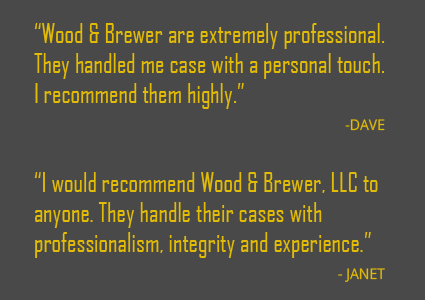 If you have questions about whether filing bankruptcy is right for you, please contact the team of Wood & Brewer, LLC and take us up on our free consultation.